This year, State Republican Executive Committeeman Eric Opiela was on the Permanent Nominations Committee. 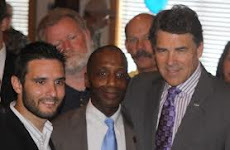 Eric tried to include Joe Straus into the list of Statewide Elected officials who get to be National Delegates. Joe Straus is NOT a statewide elected official. Joe Straus IS NOT elected by the people of Texas and he probably WOULD NEVER BE. Joe Straus is only elected by the people of his San Antonio House District. He is not more a statewide elected official than my State Rep or any of the other 150 State Representatives. Joe Straus is given the title of Speaker and is not elected in a statewide vote to be Speaker. One brave woman on the Nominations Committee, Kathy Haigler, made a motion to remove Joe Straus from the list of Statewide Elected officials because Joe Straus is not a Statewide Elected Official and if you opened the door for State Reps to get preferential treatment then there would not be any room on the national delegate list for regular Republicans to be delegates. It was also brought up that the delegates at the State Convention would likely reject Joe Straus when the Nominations Committee presented the report to the Convention Delegates. Other members of the Nominations Committee, including Bill Eastland, also openly supported Haigler’s motion. It was obvious that this was another one of the Joe Straus bag of tricks. It was planned beforehand to try to get Joe Straus on the list of National Delegates as a Statewide office holder. Eric Opiela made his rounds and tried to get people to vote for Joe Straus, but the majority of the members on the Nominations Committee voted against Joe Straus and his name was removed from the National Delegate List. The people on the Nominations Committee are chosen to be on the committee by the delegates at the convention. TX GOP Leaders are Attacking Kathy Haigler for Doing the Right Thing! Sadly, Kathy Haigler is being attacked for doing the right thing and removing Straus from the list of statewide elected officials who get to be on the list of national delegates. According to an article by Donna Garner on Voices Empower, on Monday, Michael Bergsma (who nominated Haigler), sent out an email accusing her of ambushing him, hurting him personally, hurting the CD27 Caucus, and hurting the State Republican Party. He said he has “egg on his face” and now suffers from reduced credibility. He attacked Haigler for striking Straus from the national delegate list and repeatedly stated his embarrassment. Bergsma said Haigler cannot be trusted and will never be given a position of trust again. An hour later, SREC Committeewoman Becky Berger piggy-backed on Bergsma’s e-mail, expressing the same sentiment. SREC Committeeman Bob Jones also jumped on the bandwagon in a reply to the distribution list. Lee Brandon, a CD27 state delegate, told Haigler she will forever wear a scarlet letter of betrayal. So let me get this right…. Joe Straus is elected by Democrats and even campaigns for Democrats against Republicans, and it is Haigler who is the bad guy and not Straus? Haigler did the right thing. Joe Straus is not a statewide elected official and he should not get preferential treatment over other republicans to be a delegate. Straus would not even have been voted by the delegates of the convention to be a delegate anyways and he certainly does not represent the conservative Republicans in Texas. Kathy Haigler did the right thing. Shame on these Republican leaders for attacking Haigler. I guess I am not surprised though. Becky Berger is a nice lady and I get along with her. She is dead wrong sometimes though and this is one of those issues. I was also shocked at some of her actions earlier this year. I send out my articles, like this article, via email. I actually got an email from Becky earlier this year asking me to not send any emails to ANY Republicans in her district. I was shocked! Not only does that go against the First Amendment, but it also goes against transparency and, even worse, she is making the decision about what emails people in her district should or should not get! It is up to the individual Republicans in her district to make the decision of what emails they want to get. She does not speak for them and cannot make their decisions for them. I never got one complaint from anyone in her district and if any of them want to not get emails from me they just have to click a button at the bottom of my email to get off of my list. Joe Straus is not stupid. He is a politician and a weak leader who will side with whatever will not stir up too much controversy among the State Reps. In 2010, the people of Texas overwhelmingly elected conservative Republicans to the State House. Part of the reason so many new conservative State Reps were elected was in an effort to Oust Straus. The 2011 session of the Texas Legislature had a super majority of Republicans. Joe Straus knew that he would not be able to stop some of the big pro life and voter id bills from getting passed. This is why some good legislation was passed out of the 2011 State Legislature. It had nothing to do with Joe Straus. For all we know, Joe Straus is not even pro-life! When Straus was a regular State Rep he certainly did not vote pro life and Straus has not come out and said he has changed to pro-life. All Joe Straus did was not stand in the way of the pro-life bills in the Texas House. He did this because he knew it would be the nail in his coffin if he tried to get in the way. I guess we should be thankful to Straus because Straus could have tried to stand in the way. Thanking him for not standing in the way of pro-life bills does not mean that Straus was the reason or even wanted these conservative bills to pass. Truth be told, besides the big issues that we wanted to get passed, Straus actually did hurt many of the low key conservative bills that were presented by the new, conservative State Representatives. Joe Straus is hurting. His favorability ratings are very low statewide. People just do not like him. The problem is that the people of Texas do not get to elect him. He is only elected by his district in San Antonio and he is given the Speaker of the House position by fellow State Representatives. If the people of Texas had the choice to determine who the speaker is it is very likely that he would not be speaker for very long as there would be a massive grassroots effort to elect someone else. Joe Straus even had a challenger in his own district which is something that does not happen to the Speaker of the House. So why is he still Speaker if people do not like him? Joe Straus was a left leaning Republican. He even voted against pro-life bills and got money from Planned Parenthood. He first got in, not by a vote of Republicans but because Joe Straus teamed up with the DEMOCRATS and got all of the Democrats to vote for him. Joe Straus was elected by the Democrats to be Speaker. Once he became Speaker it becomes very difficult to get everyone to try to beat a sitting Speaker. State Reps know that if they try to oppose Joe Straus they can be greatly punished because of the power that the Speaker has. They could be hurt in Redistricting (Joe Straus hurt good conservatives in redistricting last year) and they would be given bad committees where they will not be able to do anything. Most of Joe Straus’ Committee Chairmen have failing conservative ratings so we know which direction Joe Straus leans. Many of the attacks Joe Straus made against conservative State Reps failed thankfully. One such attack was when Joe Straus tried to get rid of super conservative James White by putting him in a district with a Straus Chairman. White voted against Straus for Speaker of the House. Thankfully, Super Conservative James White WON and defeated his Straus Chairmen opponent Mike Hamilton (who had some ethics problems revealed during the race) . In fact, many of Chairmen and Leaders for Joe Straus were defeated! Once again, the grassroots Republicans are speaking but Straus does not and will not care. Even under the threat of getting hurt by Straus, one State Representative Bryan Hughes has stood up to face the uphill battle for the Speaker of the House against Joe Straus. Putting Pressure on Joe Straus all the time will help get the word out about Joe Straus, and also it will push Straus into a corner where he has to try to at least act conservative in order to fend off the attacks against him from conservatives. Eventually Straus will be beaten and we have to keep up the pressure. I'll be rooting for Hughes in the Speaker's race as well. I will be rooting for Hughes also! I had the opportunity to meet Bryan Hughes at the state convention last week, and the first question I asked him was will he finish the race and not drop out like Paxton. GO HUGHES!!! Hughes is a great guy, but Straus is a great leader. That's what the House needs right now. The only reason Ken Paxton withdrew is because he lost over half of his support that morning... prior to the convening of the legislature, Warren Chisum took all of his followers and went over to Straus when he had pledged to support Paxton. The only way for Ken to be able to make a personal privilege speech was to withdraw and speak to the entire body about WHY he was running. I commend him for that - and also Leo Berman for calling for the record vote.